GPS Driving School is a small, first class driver training business that primarily operates driving lessons within Brisbane’s western suburbs. At GPS Driving School, we encourage students to enjoy each lesson, whilst remaining focused on learning the correct steps to plan for when approaching all intersections on road and in accordance with the current road rules. These include traffic lights, roundabouts, freeway merges, slip lanes, form 1 lanes as well as a variety of street intersections encompassing your local area as well as the relevant test area intersections. In your driving lessons, we can help you develop the complete range of driving skill sets required to safely drive on all roads. These include: acquiring the foundation knowledge and correct road behaviours whilst driving, a framework or system of vehicle control to drive within and a plan to control your car when approaching all types of intersections and merges. Each of your lessons is progressive and builds on the foundation skills that make up defensive driving. We pride ourselves on being effective managers of learning and will continually strive to efficiently step you through the driving program, ranging from simple tasks to the more complex such as multi-lane roundabouts and high speed freeway merging. We can confirm that all our students undertaking driving lessons with GPS become much safer drivers, by acquiring the correct skills and awareness to drive defensively and to develop these skills early in their driving experience. During your western suburbs driving lessons we will work to ensure you develop each set of driving skills at a pace that works for you. Only small elements of the driving process are delivered at any one time, allowing you to practise and consolidate your learning ensuring you are able to experience success and progress at every lesson. Your GPS Driving Instructor is very familiar with conducting driving lessons in the western suburbs and we will initially choose quiet locations for your lessons. We deliver high quality training drills in each lesson to develop the essential driving habits like correct road position, safe following distances, speed control and understanding what steps to take to safely approach and effectively scan intersecting roads. At GPS Driving School we have many training circuits set up for varying degrees of driving ability and many of these training circuits are contained within the western suburbs of Brisbane. GPS, is a leading Westside driving school and your trainer understands that some learners can be very nervous about their first lesson. but rest assured, it will usually only take a few minutes to relax and start to have fun with learning how to drive. For example, beginning learners who are keen to start can practice on the roads around Mt. Ommaney, Westlake and Jindalee. These suburbs have some excellent street circuits featuring wide, quiet, low traffic roads that provide ample time and space to learn how to turn left and right, as well as approaching give way and stop signs and practising the System of Vehicle Control. Closer to the city, Mt.Cootha provides an excellent circuit for learners to practise the basic skills of acceleration, deceleration, braking and correct gear changes in a quiet, yet challenging circuit. The first element that most students need to work on is steering the car. For many learners much of the first lesson will focus on correct steering technique. It can take a while for students to understand that when you turn the steering wheel you will need to also return the wheel back to straight, at the correct time and angle. There are quite a few good locations around the Brisbane’s western suburbs area that allow you to quickly master the art of steering. Additionally your GPS instructor will teach you how to apply the correct method of steering when driving at higher speeds, lower speeds as well as turning left or right out of a street. 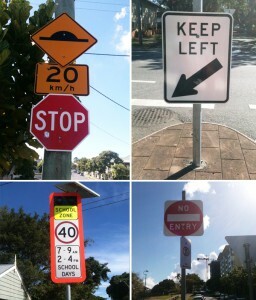 The streets in the western suburbs of Jindalee, Westlake, and Mt Ommaney have some great corners that allow learners to quickly learn and apply the main methods of steering being: push pull and fixed steering as well as a third technique called – ‘hand over hand’, which is useful for turning the wheel quickly into car parks and for some manoeuvres. Middle Park has a great loop drive for Learner Drivers. For any Learner living in the Middle Park, Mt. Ommaney area, the loop encompassing Horizon Drive and Mt Ommaney Drive and Westlake is great to practice some really basic skills, in a calm, relaxed environment. Roundabouts are great for smoothing out steering technique and improving the critical attributes of early planning and observation skills. St Lucia, Indooroopilly and Taringa are also good suburbs to improve your steering skills whilst incorporating quiet, single lane roundabouts. Often, traffic density is very low in St Lucia and parts of Indooroopilly and this enables you to concentrate on negotiating roundabouts, practising the give way to the right rule, whilst aiming to remain continuous when crossing the give way line, where possible. This will involve interacting with other road users including buses, pedestrians, cyclists and other drivers. 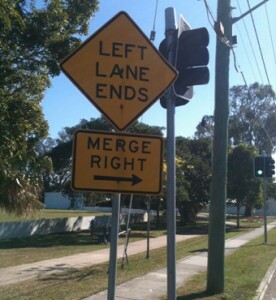 Whether your test is in Rosalie or Sherwood, you will be required to negotiate multi -lane roundabouts. These offer challenges for learners trying to cope with the large volume of traffic quickly passing through. 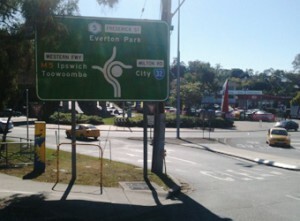 The Toowong roundabout is the main roundabout servicing all vehicles commuting from the western suburbs of Brisbane and wanting to reach the city and beyond. It is the main arterial for the western suburbs of Brisbane and results in an almost constant flow of Traffic into the Toowong roundabout. Even experienced drivers can find it challenging to safely enter and exit this roundabout. Learner Drivers are expected to demonstrate they can safely enter and exit the roundabout from all directions. With some assisted training and focused practice, you can learn to develop good judgement and decision making skills that enable you to safely enter and exit this roundabout as well as the Oxley roundabout with confidence. When you give way at a multi-lane roundabout, as well as looking for a gap in traffic coming directly from the right, you should look for traffic entering from the other side of the roundabout or coming around on a right turn. These blocking vehicles cause traffic entering on your right to stop and give way while they pass. This opens up a small gap to evaluate the situation and make a decision. If the vehicle proceeds to exit the roundabout to your right, then this is your small window to enter the roundabout whilst the vehicle ‘blocks’ the traffic entering from your right. 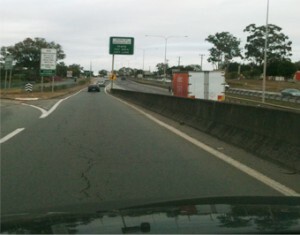 There is a very strong likelihood that the Toowong or Oxley roundabout will be part of your Practical Driving Test. GPS is one Brisbane’s leading Driving Schools meaning we can help you learn and master these challenging intersections with renewed knowledge, skills and confidence. Many of the western suburbs including Indooroopilly and Sherwood are excellent training grounds to get an introduction to traffic lights. The traffic lights at the Mount Ommaney and also in Graceville control a multi-lane intersection that includes several slip lanes. A slip lane is an area of road for vehicles turning left and sometime right, that is separated from other parts of the road by a painted island or traffic island with a, ‘Turn left at any time with care,’ sign and a give way line at the end of the slip lane. When you drive onto a road from a slip lane, you must give way to all pedestrians and vehicles on the road you are entering. There are numerous, complex set of traffic lights at Mt Ommaney, Sherwood, Graceville, Indooroopilly and closer to the city and we will take you to all of these as part of your wider learning. At GPS Driving School we like to drive in a variety of different traffic light intersections, especially in the early logbook hours, so you get the knowledge and confidence to negotiate these safely and can understand the complexity of some intersections with their multitude of signs and lines, for example on and off ramps to the Western freeway or the Riverside Expressway leading into and out of Brisbane City. The back streets of Sherwood and Rosalie are also great places to practice manoeuvres for your Driving test. Nearby, there are streets with small hills where you can practice Hill-starts in a manual car as well as automatic. There a some narrow streets, just the right width to try your Turnarounds (3 or 5 point turns). Because the gutters here are vertical it makes an ideal area to practice Reverse Parking and Straight Reversing. Your GPS instructor is an Accredited Master Driver Trainer. This means your western suburbs driving lessons with GPS means that you are guaranteed to receive a highly qualified, effective Master Driver Trainer where you are guaranteed to learn from the best! Step by step instruction specifically designed for your individual learning needs, delivered by a highly qualified and patient Master Driver Trainer. Excellence in Teaching program delivering clearly defined outcomes, time efficient training methods, focused opportunities to practise, challenging driving tasks and targeted feedback to help you improve. Continual feedback to correct and reinforce all aspects of your drive; backed up with full illustrations and diagrams to aid your learning. At the completion of your lesson, we conduct a full review of your learning that reinforces the key messages to be taken away and practised under supervision. Promoting defensive driving a knowledge of current road rules, a smooth, safe and relaxed drive and mindful of adopting a ‘’shared approach’’ to driving on road with all other road users. Complete learning and thorough preparation for your practical driving test. We ensure every minute of your lesson counts, in every lesson! GPS Driving School has been supporting learner drivers in the western suburbs of Brisbane for many years. If you live in Mt Ommaney, Jindalee, Indooroopilly, St Lucia, Sherwood, Toowong, Brookfield, Kenmore and all surrounding suburbs, and are looking to secure a highly qualified and Accredited Master Driver Trainer to help you learn effectively, please call us on 0430 284 285.